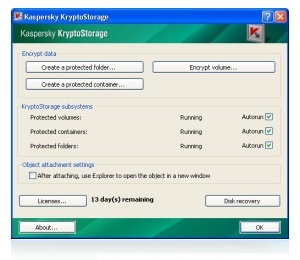 Kaspersky KryptoStorage securely protects your personal files. Kaspersky KryptoStorage safeguards your private life from unwelcome attention. Kaspersky KryptoStorage ensures that your encrypted data stays confidential in the event of malware attacks, unsecure WiFi connections and even if your laptop or storage device is lost or stolen. Whatever the threat, your personal data remains securely protected against unauthorized access. With Kaspersky KryptoStorage, you can lock your valuable data away in digital containers, protected by the powerful AES-128 strong encryption algorithm. Kaspersky KryptoStorage prevents unauthorized access to your encrypted data. Qweas is providing links to Kaspersky KryptoStorage 1.0.268 as a courtesy, and makes no representations regarding Kaspersky KryptoStorage or any other applications or any information related thereto. Any questions, complaints or claims regarding this application Kaspersky KryptoStorage 1.0.268 must be directed to the appropriate software vendor. You may click the publisher link of Kaspersky KryptoStorage on the top of this page to get more details about the vendor.